We posted leaked images of the D800/D800E yesterday and today, Nikon has announced the D800 and D800E. The pixel count of the long-awaited replacement for the D700 means it also trumps the D3X as the highest-resolution camera in Nikon's lineup. Why is there two versions? The D800 is 'stock' where as the D800E is a more expensive model that will be free from the effects of an anti-aliasing filter. Aimed at studio and landscape professionals the D800E should theoretically begin to rival medium format digital equipment in terms of resolution. D800 will retail for $2999.95 and D800E will retail for $3299.95. They will be available late March 2012 and mid April 2012, respectively. For shooting with minimal noise in a variety of lighting conditions, the D800 features a wide native ISO range of 100-6400, expandable to 50 (Lo-1)-25,600 (Hi-2). Nikon engineers have created innovative ways to manipulate light transmission to the sensor’s photodiodes, giving users the ability to shoot with confidence in challenging lighting conditions. Internal sensor design, an enhanced optical low pass filter (OLPF) and 14 bit A/D conversion with a high signal to noise ratio all contribute to a sensor capable of excellent low light ability despite the extreme resolution. Every aspect of this new FX-format sensor is engineered to deliver amazing low noise images through the ISO range and help create astounding tonal gradation and true colors, whether shooting JPEG or RAW. Images are further routed through a 16-bit image processing pipeline, for maximum performance. To further enhance versatility, users are also able to shoot in additional modes and aspect ratios such as 5:4 to easily frame for printed portraits or a 1.2X crop for a slight telephoto edge. For even more versatility, photographers can also take advantage of Nikon DX-format lenses for more lens options and enhanced focal range (1.5X), while still retaining sharpness and details at a high 15.4-megapixel (4800x3200) resolution. 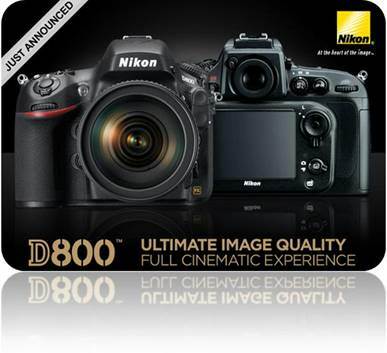 The Nikon D800 will be available in late March for the suggested retail price of $2999.95. The D800E version will be available in mid April 2012 for a suggested retail price of $3,299.95. For more information about these models, NIKKOR lenses and other D-SLR cameras please visit www.nikonusa.com.